Students Imogen Langdon, Kynan Vogelaar, Grace Prasad and Lewis Hudacek with Phil Sullivan. STUDENTS at Mother Teresa Catholic College in Baldivis were enthralled by the 10th Australian Light Horse display that visited their school last week. Although not having served himself, Phil Sullivan said his collection represented his two passions: horses and the army. 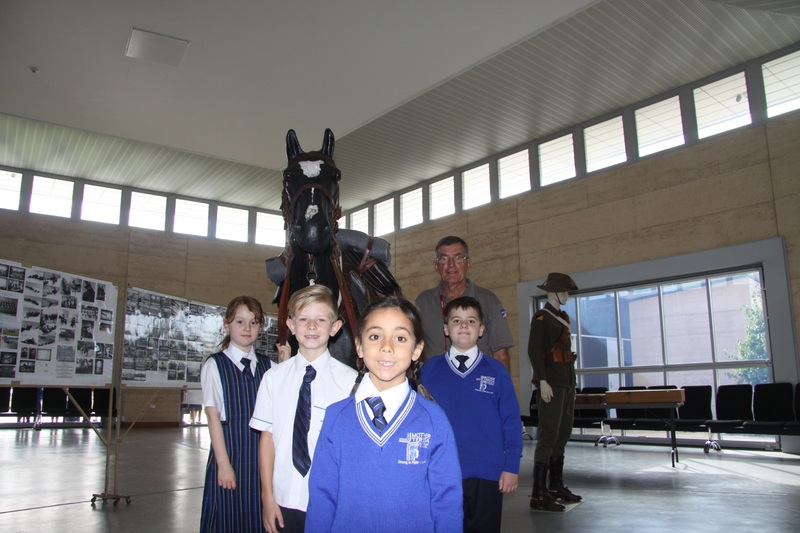 Mr Sullivan travels with his display to schools throughout WA giving talks to students about the history of the Light Horse Regiment. Among other things, he explains what role the horses played in war. He said he began his collection in 2001 and had done about 30 shows, including participating in Anzac parades. The display includes life-size models of a Light Horse soldier and Light Horse, both in WWI attire.